Chasin’ Tail Update: What’s Happing in the Woods Now? Well, being midway through November and with Minnesota’s second week of the firearms deer season in the books, I thought I’d post an update of how our season is progressing. This past weekend we struck out! I have hoped for gray skies and snowflakes for a long time and on Saturday, I finally got my wish! However it didn’t pay off the way I hoped it would. Saturday it rained, then sleeted, before finally gently falling flakes began to blanket the woods. (I’ll quickly tell you something about myself) I LOVE hunting in the snow!!! Sunday morning was beautiful but slow. We hunted hard all week and weren’t able to make anything happen. The weather has been less than ideal for sometime now, but it’s one of those things we just can’t control. So we’ve been doing the only thing we can — putting our time in! I really had high hopes for the fresh snowfall, since this usually gets the deer moving. I’ve been keying in on does and their core areas. Knowing that it’s only a matter of time before a lovely lady brings a big boy in tow. We are seeing A LOT of does! That’s partially what is so frustrating! We’re seeing does every time we hit the woods, but rarely encountering bucks. For the most part, the bucks that we are seeing are really young. They’re also the ones we’ve seen chasing and harassing does the most, which is common early in the rut. Young bucks sometimes jump-the-gun a bit, but by now, big mature bucks should be on the hot does. I don’t think we’ve ever had a year quite like this? Big buck sighting have been scarce so far this season. SO…here’s the plan…I feel like it’s time to get a little aggressive. We aren’t connecting with the bucks we’re looking for. Justin has spotted “Big 10”, one of our top target bucks a number of times in the last two weeks. He’s kept in tight with one particular doe and has been disinterested in everything else and we haven’t been able to get him into bow range. So it appears he’s got himself a little girly friend! He’s got a doe on lock down and we’re going to sneak right into that doe’s core area — an area I typically try not to disturb. Depending on the weather and wind, Justin will set up in one spot in this area and I’ll set up where I think he’ll travel to evade him if he does. Other than that we’re going to continue to have faith in our traditional hot spots and bounce around to a few other areas. Wisconsin has been slow too! We haven’t been over the border for a few days now. We want to give a couple of our areas a break. A lot of these deer are very cagey. They’re not used to farm equipment, or tractors running for example, they’re really un-pressured but very weary and bust you easily. If you give a big woods buck a reason to bust out of an area, it can be a loooong time before you see him again (if ever) in that particular area. So we’re keeping it quiet over there for now. The WI firearms opener is this weekend and Justin has a pocket full of tags and I have some tricks up my sleeve and you can bet we’ll be out there again! Oh! — did I mention the temporary doe restriction in a select few areas has been lifted? Yep! My dad is licking his chops so we’ll be looking to take a couple does coming up too! So that’s how we’re approaching the second half of November. We hope your season is going well and would like to wish all of you the best of luck out there as well! Thanks for tagging along, stay tuned and good huntin’! 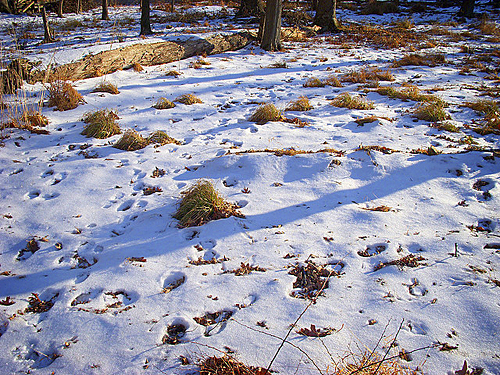 A nice dusting of snow gets deer on their feet!